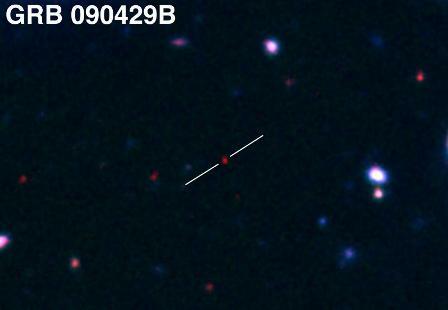 A cosmic explosion detected by NASA's Swift satellite in April 2009 has been newly unveiled as a candidate for the most distant object in the universe. At an estimated distance of 13.14 billion light years, the gamma-ray burst lies far beyond any known quasar and could be more distant than any previously known galaxy or gamma-ray burst. Multiple lines of evidence in favor of a record-breaking distance for this burst, known as GRB 090429B for the 29 April 2009 date when it was discovered, are presented in a paper by an international team of astronomers led by former Penn State University graduate student Antonino Cucchiara, now at the University of California, Berkeley. Researchers have unveiled a gamma-ray burst detected by NASA's Swift satellite in April 2009 as the latest candidate for the most distant object in the universe. Credit: Gemini Observatory / AURA / Levan, Tanvir, Cucchiara. Assuming a big-bang universe, the gigantic burst of gamma rays erupted from an exploding star when the universe was less than 4% of its present age and less than 10% of its present size. This means that the exploding star's galaxy had less than 520 million years in which to condense from ionised hydrogen and helium and then produce mature stars. "The galaxy hosting the progenitor star of GRB 090429B was truly one of the first galaxies in the universe," said Derek Fox, associate professor of astronomy and astrophysics at Penn State and a co-author of the paper. "Beyond the possible cosmic distance record, GRB 090429B illustrates how gamma-ray bursts can be used to reveal the locations of massive stars in the early universe and to track the processes of early galaxy and star formation that eventually led to the galaxy-rich cosmos we see around us today." These afterglow measurements were used to determine a cosmic distance record in 2009 for an earlier gamma-ray burst, GRB 090423 at a distance of 13.04 billion light years from Earth, making it temporarily the "most distant object in the universe." This record was surpassed by galaxy discoveries in 2010 and 2011 that pushed the cosmic frontier out to 13.07 billion light years, and potentially even further. "Our extreme estimate of the distance to GRB 090429B makes this a sort of 'revenge of the bursts,'" said Cucchiara. "A gamma-ray burst is once more contending for the title of most distant object in the cosmos — beyond the previously known most-distant quasars and galaxies." Less than a week after the record-setting GRB 090423 made headlines around the world, this new burst, GRB 090429B, appeared in the sky with suspiciously similar properties. As with the previous burst, GRB 090429B was a short-lived event, lasting less than 10 seconds, and automated Swift observations showed it to have a relatively faint X-ray afterglow. Cucchiara, then a graduate student at Penn State, woke up in the early morning hours to direct observations at the Gemini North telescope on Mauna Kea, Hawaii, that he hoped would pin down the nature of this burst. Working with coauthors Andrew Levan of the University of Warwick, Nial Tanvir of the University of Leicester, and thesis supervisor Derek Fox of Penn State, Cucchiara found that, while the afterglow was visible in infrared observations, no optical light could be detected. This "drop out" behaviour is a distinctive signature of the most-distant objects, and has been used for initial identification of all of the most-distant quasars, galaxies, and gamma-ray bursts. Cucchiara requested an immediate spectrum of the GRB 090429B afterglow from the Gemini operators, which would have provided a definitive measurement of the distance to the burst. Unfortunately, just as the spectrum was about to be taken, clouds blew in over the summit of Mauna Kea and hid the afterglow from sight. By the next night, the afterglow was too faint to yield a useful spectrum, and over the following nights it faded from view completely. "It was frustrating to lose sight of this burst, but the hints we had were so exciting there was no chance of us letting it go," said Cucchiara, who presented an initial study of the burst as part of his doctoral thesis at Penn State. Determined not to let GRB 090429B become "the burst that got away," the team spent two years carrying out a careful examination of their data to see if the burst is truly a candidate record-breaker, or might be a partially-obscured burst in a galaxy at a less dramatic distance. Importantly, this work has meant gathering new data — deep observations with Gemini and the Hubble Space Telescope that would have revealed a galaxy at the burst position in any of the less-dramatic scenarios. This evidence, including the missing galaxy, indicates that the burst is extremely likely — a 99.3% chance — to be the most distant cosmic explosion, beyond the record set by GRB 090423. It also has to lie beyond the distance of a galaxy reported in 2011 by a team of astronomers led by Rychard Bouwens of U.C. Santa Cruz. This could be either easy or hard: The Bouwens team estimates that there is a 20% chance their galaxy is not a record breaker at all, but simply a faint galaxy at a relatively modest distance; on the other hand, if the Bouwens galaxy is a record-breaker, it is very distant indeed, from 13.11 to 13.28 billion light years away, and there is only a 4.8% chance that GRB 090429B is more distant than that. Overall, and treating these uncertainties as perfectly understood, there is a 23% chance that GRB 090429B is now the most distant known object in the Universe, the astronomers said. With better luck, or more advanced facilities, it should be possible in the future to use the bright afterglows of bursts like GRB 090423 and GRB 090429B to explore the conditions of star and galaxy formation at these early cosmic epochs in detail.